Lancet point stainless steel cannula (cannula are considered needles if affixed to a hub) are used in countless applications ranging from industrial to medical. They are CNC (automated) machine triple ground stainless steel (or other alloy) tubes with a sharpened point. 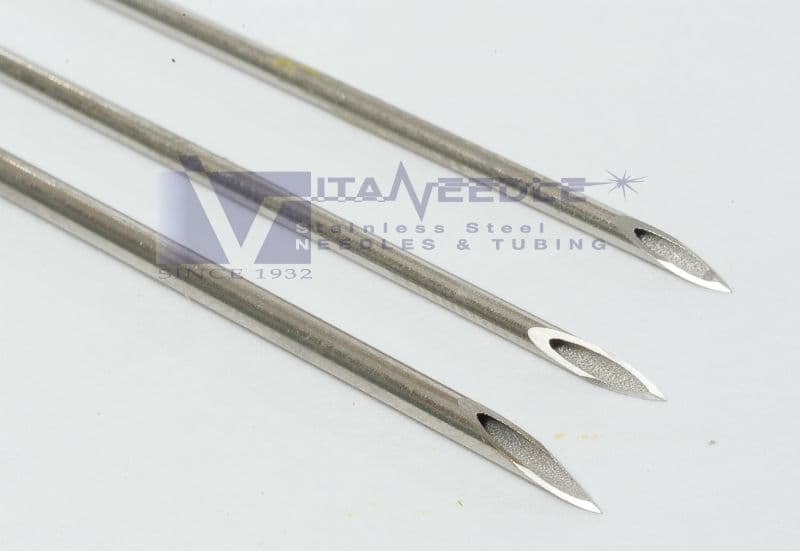 Vita Needle can now offer short runs of lancet points in gauges 7 – 30 with quick 1-2 week lead times for quantities of 10,000 pieces or less. 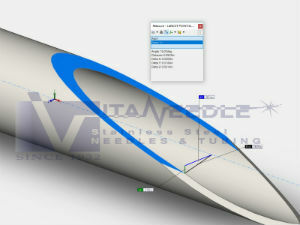 The lancet point is formed by grinding a primary bevel (typically 12 to 15 degrees primary for a regular "A" bevel, 18-20 degrees for a short "B" bevel and 25-30 degrees for a Quincke "C" bevel) and then forming two secondary bevels by rotating the tube around the longitudinal axis and completing two additional grinds on each side. The three faces meet to form the sharp point that allows lancet cannula to perform their function. Non-standard bevel angles can be requested by the customer. Typically ground several pieces at a time for cost savings, the geometry of the point can be specified either by a toleranced primary bevel degree or by toleranced bevel length. Secondary angle of rotation can be toleranced if required, although normally this feature is not dimensioned by the customer, it is selected by the manufacturer. Please note that cost increases as constraints, such as tolerances, are added to requirements. 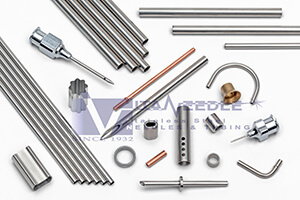 Lancet points can be formed on virtually any of the alloys that Vita Needle manufactures; most often the alloy of choice is 304 stainless steel tubing due to its’ cost-effectiveness and material availability. Another popular choice is 316 stainless steel tubing, which is typically used for improved corrosion resistance. Hard temper tubing is preferred by most customers for better rigidity, tensile strength, and finishes. All products by Vita Needle are supplied non-sterile. Having supplied lancet point needle assemblies and cannulas for decades, Vita is well positioned to respond to short to medium volume runs of cannula in very short timeframes - weeks, not months, including prototype orders. Large volumes can also be accommodated as well. Secondary operations such as finishing or assembly to hubs/components to manufacture a needle assembly can also be performed. While we do not supply off the shelf disposable, plastic hub medical lancet needle assemblies (such as the kind found in a doctor’s office for blood draw/injections), we can supply virtually any other lancet cannula/needle or produce specialized ground point geometry within machine capabilities. Please contact us with questions, visit our reusable needles, cannula point styles or fabricated parts pages to view more about our capabilities or submit a request for quotation for cannula or needle assemblies. We look forward to hearing from you!